Matthews’ carton coding and labelling solutions are designed to work for your business. With easy-to-use features and fast implementation, it’s never been easier to ensure your carton labels are correct and compliant. We also have inkjet coding solution options from thermal inkjet and high resolution to print information, branding-on-demand and more. And because all our solutions can be integrated into your production line, you can enhance the efficiency of your entire business. Barcodes are typically required on shipper cartons to satisfy retailer demands for barcode compliance. If you have a dedicated carton for each product (or SKU) you manufacture, these barcodes can simply be printed with your carton artwork. Alternatively, you can use a generic carton, with product specific information printed and applied to the carton within your production facility. 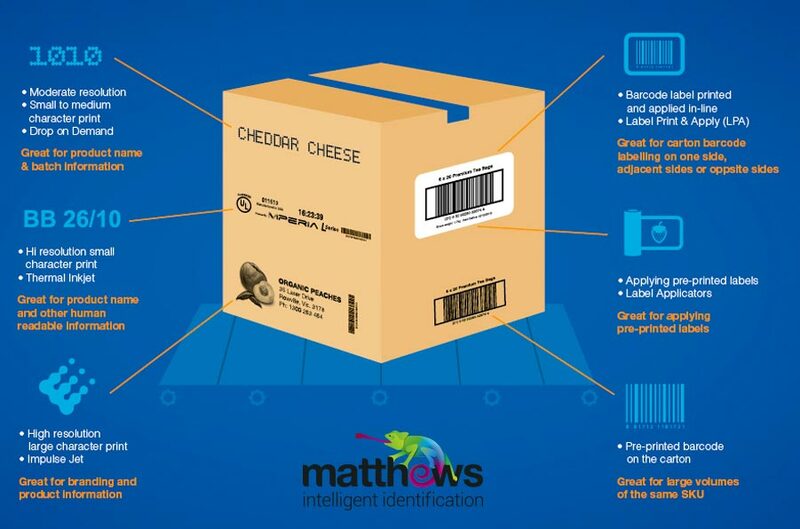 Get the correct barcoding for your cartons with Matthews. GS1 Australia coordinates the use and allocation of all retail and trade barcodes in Australia. Because Matthews is a GS1 Strategic Alliance Partner, we can help you implement the right technology solution and label formats for your application. Barcode labels are the preferred method for applying barcodes to generic cartons in Australia. It is possible to print barcodes using inkjet technology, however this method is not acceptable to major retailers, and so is not recommended unless the barcode is for your own internal use. Labels for carton barcodes can also include human readable information (e.g. use-by dates and product descriptions), potentially eliminating the need for inkjet coding of cartons. Barcode label formats are typically ITF-14 or GS1-128. GS1 compliant labels are used internally to track the carton and externally to meet retailer requirements. We will work with you to determine the best solution for your needs. Our carton barcode printers are highly flexible. Carton labels can be applied automatically at high speeds (up to 70 labels per minute) on the packing line, or off-line by hand. Inkjet technologies can be used to print best before dates, use by dates and batch information on cartons, as well as for branding. With years of industry experience and technical know-how, Matthews will help you avoid any coding and carton labelling errors. We design solutions that not only code and label the carton, but also verify the information has been coded correctly. This video showcases outer case inkjet carton coding using drop on demand inkjet printing and print & apply labelling technologies. Drop on demand technology is ideal for carton coding, branding on timber, wood and for other industrial applications.